The Craft Twinery | Home of British Made Twines. At the Craft Twinery we have a comprehensive range of UK manufactured twines including one of the finest and widest ranges of baker’s twines available in the world – the complete ‘Beautiful Baker’s Twine’ range. 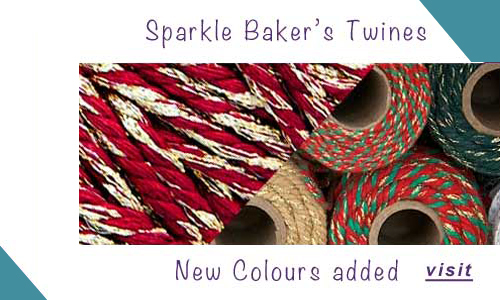 From candy stripe to solid, to metallic and even sparkle you can be sure our baker’s twine range (more info on bakers twine) has a twine that matches the creative vision you have for you crafting project. In addition to cotton baker’s twines we also have a range of food safe rayon butcher’s twines in plain white, candy stripe and tri-colour. We also stock a plethora of coloured jute craft twines including the standard organic green and brown jute twines, in addition to flax and polyhemp twines for upholstery, strong sisal twines for packaging, polypropylene twines for the home, office and garden and a range of decorative ribbons. 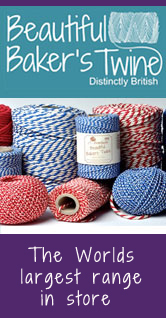 We have a wide range of British made craft strings available in various diameters including standard and polished cotton string, cotton craft string and macramé twine, coloured cotton string, traditional parcel string for tying brown paper parcels, jute string for macramé crafts, garden string for horticultural use and general purpose household string. All are available either as a ball, spool or even in a tin, in various sizes and are manufactured in the UK. We also specialise in craft cords. We stock a range of coloured cotton ‘Baker’s Braid’ cords available in all the colours of the ‘Beautiful Baker’s Twine’ range. These cords (braided cords info) are ideal for use in projects for crafters requiring a thicker and stronger product as an alternative to smaller diameter twines. We are also suppliers of polyester braids, commonly known as blind cord, in a range of colours and these are ideal for use in the production of Festoon Roman and Austrian blinds. In addition we are also stockists of a selection of braided and twisted piping cords in both natural cotton and polyester for use in upholstery and clothing projects. Lamp shades made from coloured cotton ropes by Fusion DNA Design and Architecture for Nando's. 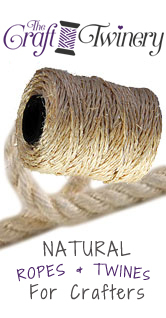 We are one of the UK’s leading suppliers of ropes for the home hobbyist and interior designer. Our selection of hollow cotton braids is one of the largest available online and is available in all the colours of the ‘Beautiful Baker’s Twine’ range. Although originally intended for use as magician’s ropes our coloured braids are perfect for use in arts and crafts and those interior design projects and have been used by household high street names such as Nando’s. We also stock a comprehensive selection of traditional three strand ropes in cotton, sisal, manila, hemp and polyhemp, perfect for those craft projects where a traditional feel is required. At The Craft Twinery we are always looking to expand our range with new lines but as there are so many twines, strings, cords and ropes it is impossible to list or stock them all. If the right product for your craft project cannot be found on our website, we may still be able to source it and we will strive to fulfil your requirements and match the samples you send.